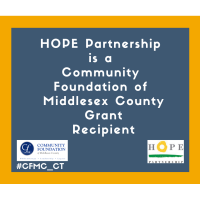 OLD SAYBROOK, CT – HOPE Partnership, Inc. has received a $4,000 grant from the Community Foundation of Middlesex County. The grant will be used to train HOPE staff to act as an administrator for approved affordable housing developments throughout the shoreline area; both for HOPE projects as well as third party projects. HOPE Partnership is a non-profit organization dedicated to developing affordable workforce housing opportunities in Southern Middlesex County. HOPE’s philosophy is to collaborate with town government, builders, and other private partners to build housing that is attractive, sustainable and appropriate to the surrounding neighborhood.